Following up on my last post about being deceived and disappointed by "apostate" gelato in a Shanghai gelato shop that went rogue, I'll share some great news: I've found the real thing at last! 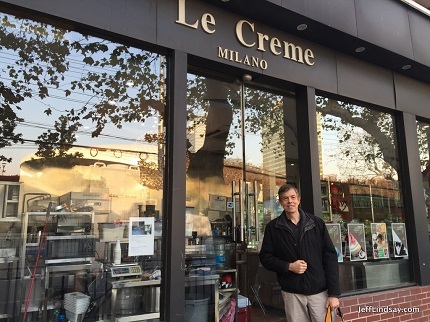 After I sent an email to the owner of a gelato brand in Shanghai about my disappointing experience in the rogue shop and their need to take legal action to protect their brand from being tarnished, the owner invited me to come to the mother store at 434 Shaanxi South Road in Shanghai's beautiful French Concession area. I did so on a free day as wife and I were between running errands and meeting people (we have a wonderful, overflowing social life in Shanghai unlike anything I've ever experienced before). We were warmly greeted by the store manager and marveled at the contrast between what we could see in front of us and what we had seen in the rogue shop. The difference in taste was even more impressive. Gelato is not just another name for ice cream. There are large differences in method of preparation, the ingredients, and even the temperature it is served at. 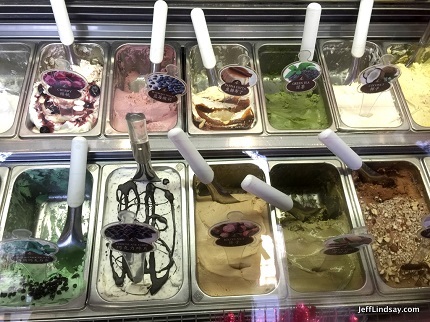 Gelato is more like a rich, very thick fluid rather than the fluffy solid of common ice cream. It takes skill and artistry to make it right, and what a delight it was to encounter real gelato once again. Ahhh! 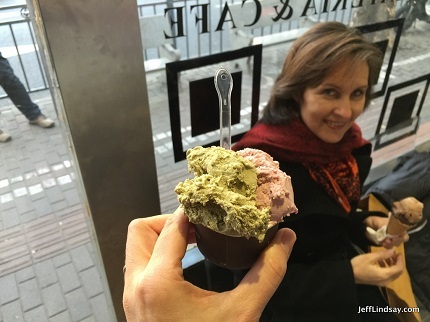 We ordered some gelato after sampling several heavenly flavors. I ordered a small cup with a little pistachio flavor and a little blueberry yogurt. The small cup was packed to hold about as much as possible, nearly overflowing with goodness, unlike the miserly, well-below-the-rim portion I received in a cup of the same size at the rogue shop. Both flavors were unforgettable. To my dismay, though, after we received the gelato, the manager refused to take our payment. "It's free," she said. "Orders from the Big Boss." Those were her words, spoken in English. The gift of free gelato, courtesy of the Big Boss. What a delicious lesson on grace. It was my birthday, but they didn't know that in giving me this perfect birthday gift on a little birthday adventure. 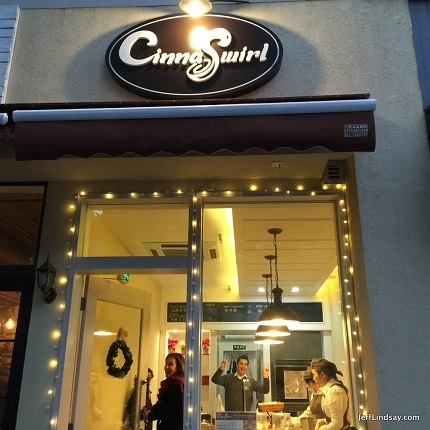 In this land of constantly puzzling coincidences, we had a similar experience at our next stop, Shanghai's supremely delicious Cinnaswirl shop near beautiful Jingan Temple (not currently an LDS temple, by the way), where an LDS couple is producing super cinnamon rolls that have people lining up for more. We wanted a dozen for a dinner event we would have the next day, and were lucky to get the last nine they had at the moment. For some reason, the owner refused payment, deciding to give us a gift that day, not knowing it was my birthday. 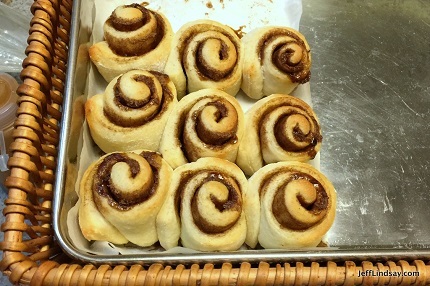 Nine big cinnamon rolls worked out fine, being plenty for our dinner with six guests the next day. Grace upon grace, with more tender morsels. True gelato has been restored to our lives. We have been the recipient of wonderfully kind, gracious gifts. At the obvious risk of trivializing that which is unimaginably profound, I feel the same way, though more strongly, about the many gifts involved in the Gospel of Jesus Christ. It's delicious above all and worth the search, worth the wait, worth whatever sacrifice may be required, for it is a gift of infinite worth that is given to us freely, if we will accept it in a covenant relationship, courtesy of the Son of God and the Big Boss/grand Father in Heaven above.